A new update to AppGameKit VR has been released today. In this new update there are two new VR demos and some extra VR commands. 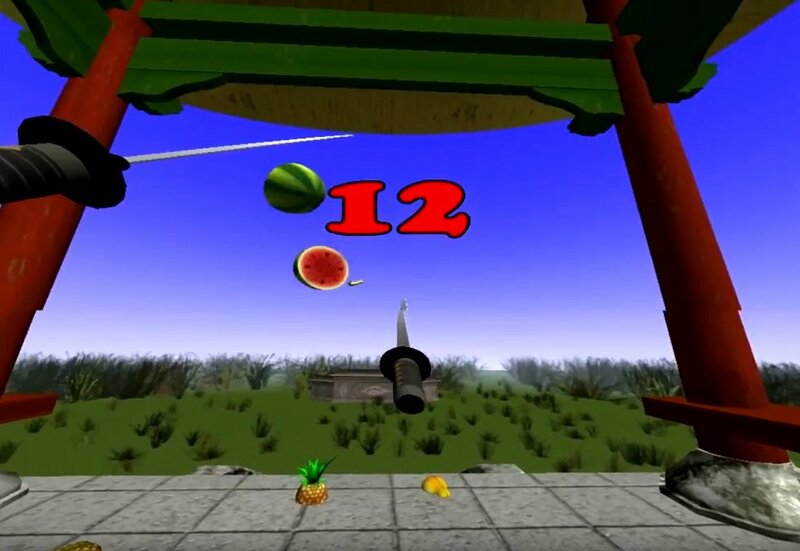 In this fun demo you are challenged to pick up your Samarui swords and slice the oncoming fruit. Behind you is a huge gong. If any fruit passes your sword swinging defences and hits the gong you will lose a life. Three strikes and the game ends. See how many you can fend off in this little demo that shows the versatility of AppGameKit VR! Before this update, when a user wanted to render the scene to the Head Mounted Display (HMD), they would just call the AGKVR.Render() command. This would first set the AppGameKit camera to the position/rotation of the right eye, then setup the camera with the right eye's projection matrix, then render the scene, then submit the render to the HMD. It would then follow the same sequence for the left eye. This worked great because is was really simple. The only problem was that it gave no opportunity for the user to do any post processing to the render image before it was submitted to the HMD. These new commands allow the user to manually go through all of these steps, which then allows you to do some post processing prior to submitting the final render images to the HMD. With the new commands, you would call SetCameraToRightEye() to set the camera's position/rotation and projection matrix to the right eye. After that, you can manually render the camera to an image using the SYNC or RENDER commands in AppGameKit. You can then apply some post processing to the rendered image through shaders. Finally, you submit the result to the HMD using the SubmitRightEye() command. You then do the same with the left eye. Note that the old method still works but these new commands give some added control that is required for using full-screen shaders. We have added a full screen shader demo so you can see how this is done in a practical example. Existing users can download this update right now and, if you don't own this DLC, the AppGameKit VR DLC is currently on special offer, so it's a great time to grab this great DLC at a bargain price!